The Reynolds Cruisers in Black and Gold. I don’t know a better way to commemorate the one year anniversary of the epic Emerica video Stay Gold, then going out and getting a pair of the Vegan Black and Gold colorway, (you can also stay in and just order them online), watching the Video, (I know you have it, but just in case you’ve warn the disc out Uprise has it) then going out and ripping the streets up. 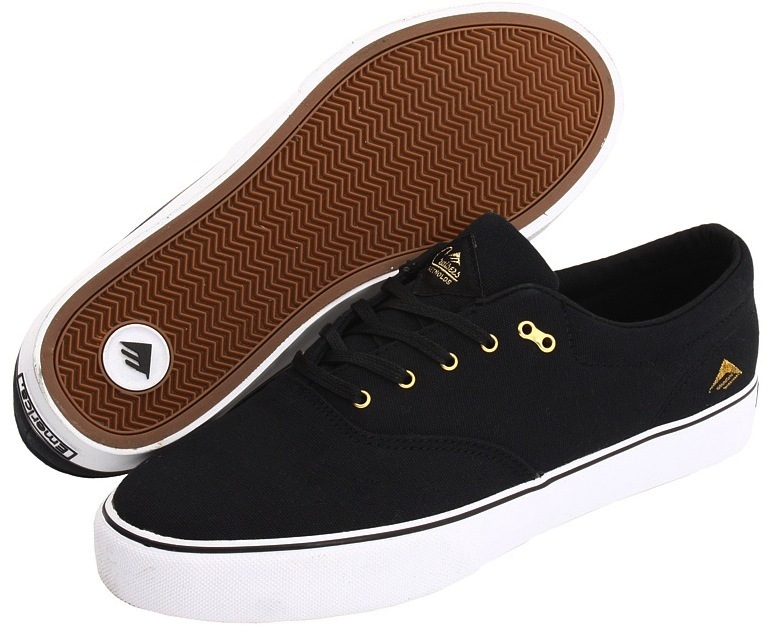 This low profile skate shoe has some slick features, check out the sweet 70’s style logo on the thin tongue. Metal gold colored eyelets, vulcanized sole, and some sweet STI technical padding. They may look lo-pro, but have you seen the stairs Andrew Reynolds drops hammers on? If you have been living under a rock, Reynolds just swept the DC Maloof Money Cup! Also available in Red White and Blue, Patriot.